Please check back. We are currently producing new product videos. These videos demonstrate how effective The Oil Eliminator series of cartridges are. The videos will demonstrate the effectiveness of various competing technologies and cartridge designs as they are run simultaneously on our test rig along side The Oil Eliminator for a fair and accurate comparison. The above photograph is from a test several years back when we first developed The Oil Eliminator cartridges. The tests were run using each companies 4.5" x 20" size cartridge. 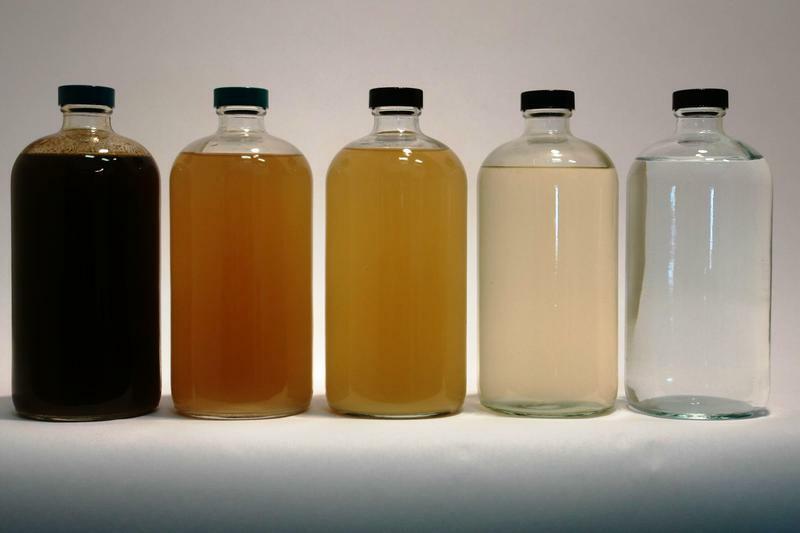 From left to right is the 628 ppm test fluid, which is a 50/50 blend of Heavy Fuel Oil and Road Diesel Oil, Company A's Polymeric Surfactant Infused Emulsion Breaking Cartridge discharge at 50 ppm, Company B's Modified Cellulose Cartridge discharge at 30 ppm, Company C's Organoclay Cartridge discharge at 10 ppm, and our The Oil Eliminator Cartridge discharge at non-detect using EPA-1664.